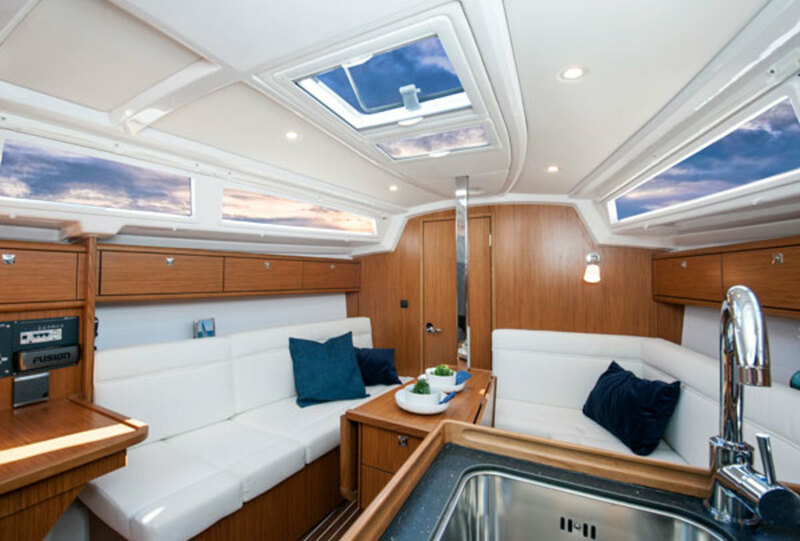 Like the rest of the Bavaria line, the hull of the Cruiser 33 is molded with e-glass using a combination of polyester and vinylester resins with a Divincell foam core in the topsides and solid glass below the waterline. To stiffen the boat a fiberglass grid is bonded to the inside of the hull and also held in place by the keel bolts. Another structural grid extends from bow to stern below the deck, which is also cored. The keel, as on many European boats, is cast iron. 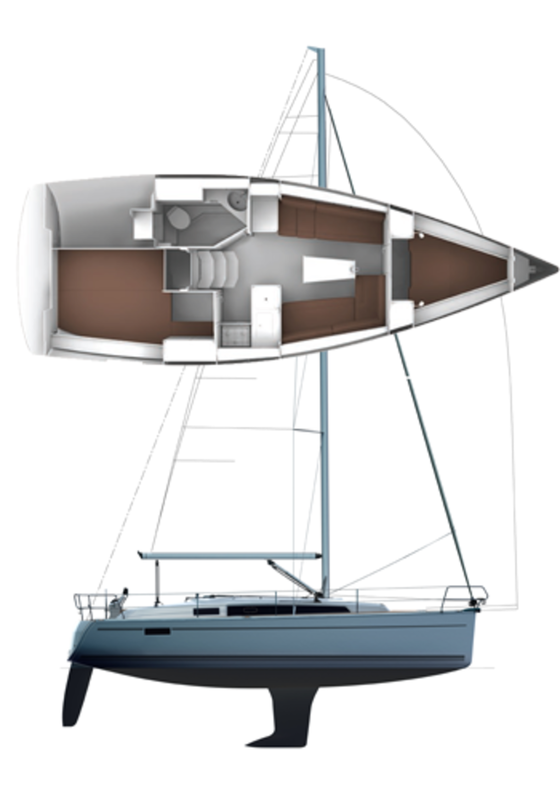 Two versions are available: a 6ft 9in-deep standard keel and a shoal-draft fin drawing 4ft 11in. The deeper version worked great in Antigua, with its substantial wind and deep water. The shallow Sea of Abaco or Chesapeake Bay in the wind-starved summer? Not so much. The double-spreader Seldén rig is aluminum; the standing rigging is wire. Overall construction quality is excellent. There was no undue squeaking or creaking under sail, even in a fairly substantial seaway. A couple of years ago, Bavaria restyled the cabinhouse, cockpit and side decks of its entire cruising line, and the result is both attractive and functional. On a boat this size, going forward often means walking on both the side decks and cabintop—especially when the boat is on its ear—and the deck layout works well in this respect. 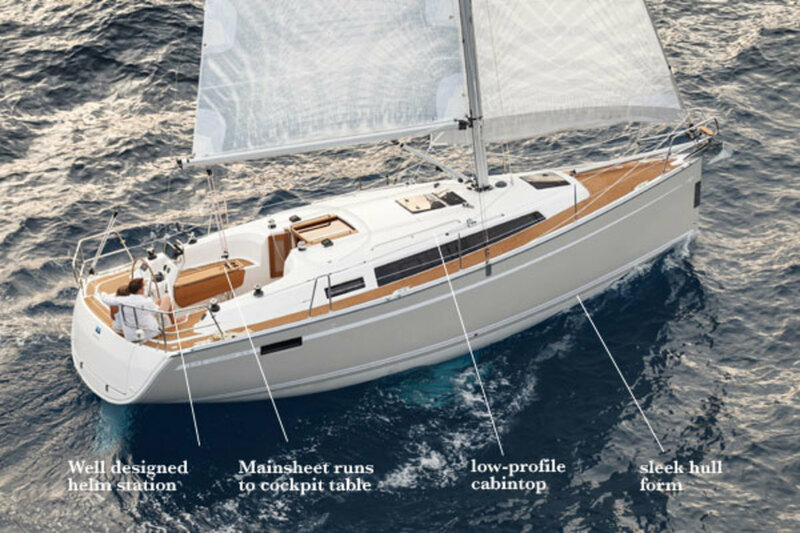 The foredeck is equally well laid out for handling the ground tackle, and the area surrounding the helm provides plenty of space for tending the wheel, whether you sit to windward playing the shifts or stand directly aft sailing downwind. One issue I had with the boat was the size of the fixed cockpit table. On the one hand, its bulk and size are great for meals and for bracing your feet against when the boat starts heeling. 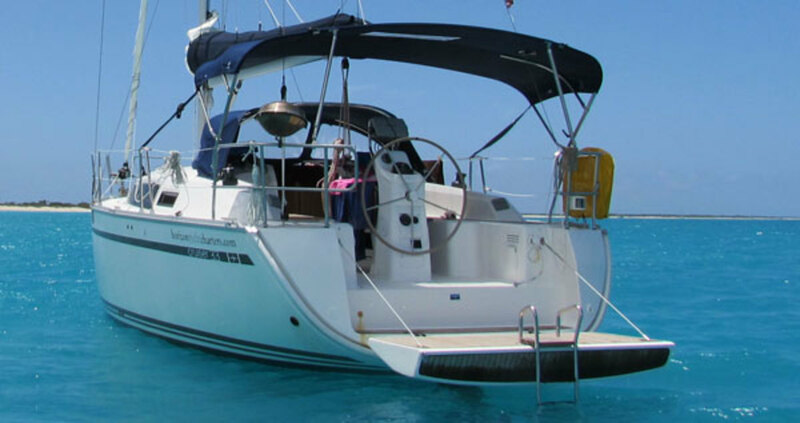 However, in combination with a dodger, a bimini and an otherwise laudably well-designed and high cockpit coaming, it can make getting around the cockpit or out to the side decks somewhat of a challenge. Without the extra canvas, of course, this problem—which is common on many mid-size boats with fixed cockpit tables—disappears. However, it’s still something to be aware of. Otherwise, the boat was well laid out with lines falling easily to hand. The mainsheet runs to a block set near the leading edge of the cockpit table and the lines leading from the Lewmar primaries and Furlex headsail furler were well within reach of the helm. I’ve long believed that boats in the mid-30-foot range are ideal for a couple or small family. To me, the Bavaria Cruiser 33 is an excellent case in point. The saloon, with its 6ft 1in of headroom, and the cabin arrangements are both straightforward and eminently practical. You’ve seen this movie before, because it works. Kudos to Bavaria for including a nav table, which is on the small side, but still does the job. The port-side settee doubles as the seat for said desk, and although you might have to dangle your toes over the edge a bit, it also works as a sea berth, even for a six-footer like me. The starboard-side quarterberth is a bit cave-like, thanks to the fact it’s directly under the cockpit sole, but it still offers a wealth of sleeping space—this is after all only a 33-footer—and the V-berth is wide enough in the toes that, again, even a 6-footer like me can get a good night’s sleep. One area that struck me as a bit tight was the galley. But I don’t know where you’d find the space to make it any bigger without seriously impacting the dining area or the aft cabin. My other concern was the saloon table and that fact that it’s so large. Like the table in the cockpit, it’s great for entertaining, but it can be tough to get around it belowdecks. Again, hardly a situation that is unique to the Cruiser 33. Suffice it to say, three adults and one child lived in the space for the better part of a week quite comfortably. Not bad for a boat measuring just 33 feet overall. One of the high points of a charter in Antigua is the 25-mile open-water passage to the neighboring island of Barbuda, and given the chance to stretch her legs, the Cruiser 33 absolutely shone, eating up the miles and taking care of its crew both coming and going. Northbound, we sailed a beam to broad reach the entire way, with seas up to six feet on our starboard quarter, clicking off 6-7 knots without even trying. Southbound we sailed a close reach in similar conditions, and again the boat did a great job, with minimal pounding and little spray coming aft. To avoid being blown east of Antigua I sailed the boat largely by feel, pinching up as the wind hit the upper teens and then sailing a little fatter to keep the boat moving in the lulls—all the while maintaining a target speed of 5.5-6.5 knots even though we were towing a dinghy. Not bad! It would be fun to see how the boat would do on an even longer passage. One thing: our test boat carried a traditional mainsail, as opposed to the in-mast furling main that comes standard with the boat in the United States. On a boat this size, it just makes sense to go with the rig that allows you to make the most of its slippery hull form, deep keel and large rudder. The boat maneuvers well, which should come as no surprise given its big rudder. What did surprise me was the way it powered into the swells after coming around the southwest corner of the island on our way to Falmouth Harbor. As motorsailing became increasingly problematic with the wind backing until it was well and truly on the nose, I just tached up the auxiliary to around 2,700 rpm, and the boat shot ahead at 5.5 knots. Ya gotta love that kind of power, when you have one last headland to round and the rest of the crew wants to be in the anchorage half an hour ago. If that isn’t the mark of a good cruiser, I don’t know what is. The ideal cruising boat does two things: it sails well and takes care of its crew, especially those members who aren’t seasoned sailors. 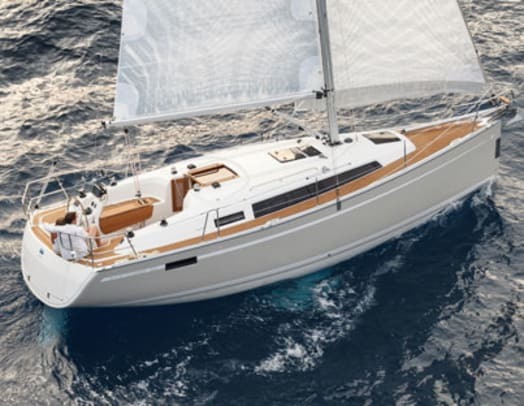 By these standards, the Bavaria Cruiser 33 is close to ideal, providing an experience afloat that belies its moderate LOA.